At one time or another, we all played with anagrams, and had fun while rearranging the letters of a word or a phrase to produce a new one. This type of wordplay we all know and love, has inspired artist Massimo Agostinelli to create a series of works focusing on the enigmatic meaning of expressions associated with famous people and iconic objects. These works will be presented at Anagrams exhibition, that will be on view at Hoerle-Guggenheim's Gallery in New York. For the upcoming show, the artist merges changeable phrases and classical and pop culture imagery by employing a unique art technique of lenticular printing. Massimo Agostinelli’s works begin as digital renderings, performed on customized plastic panels with corrugated edges. His artworks are made with lenticular printing, technology that uses lenticular lenses to create an illusion of depth in two-dimensional images. While viewers move around the gallery, images shift and change to discover their dual meaning. Massimo Agostinelli often incorporates text to his artworks and is very passionate about wordplay and text art. One of his previous series depicted images paired with palindromes (words that read the same both forwards and backwards). In an interview for Widewalls magazine, the artist discovered that this passion dates back to his school days. “There are two subjects in school, which I’ve always naturally excelled at, Art & Design and English Literature. I wanted to find a way to create a fusion or bond between words and imagery.” – he said. While matching meaningful messages with powerful images, the artist often examines the possibility of written words taking the life of their own and living independently from images, drawings, paintings or sculptures that contain them. By exploring how words may exist separately from an image they constitute, the artist draws from the heritage of Pop and Conceptual artists such as Ed Ruscha, Barbara Kruger, and Jenny Holzer. Anagrams artworks contain numerous references to pop culture and Pop art movement, but also to the old masters of classic painting. For instance, Franz Xaver Winterhalter’s painting of Queen Victoria is interrupted with big white letters written across the artwork. 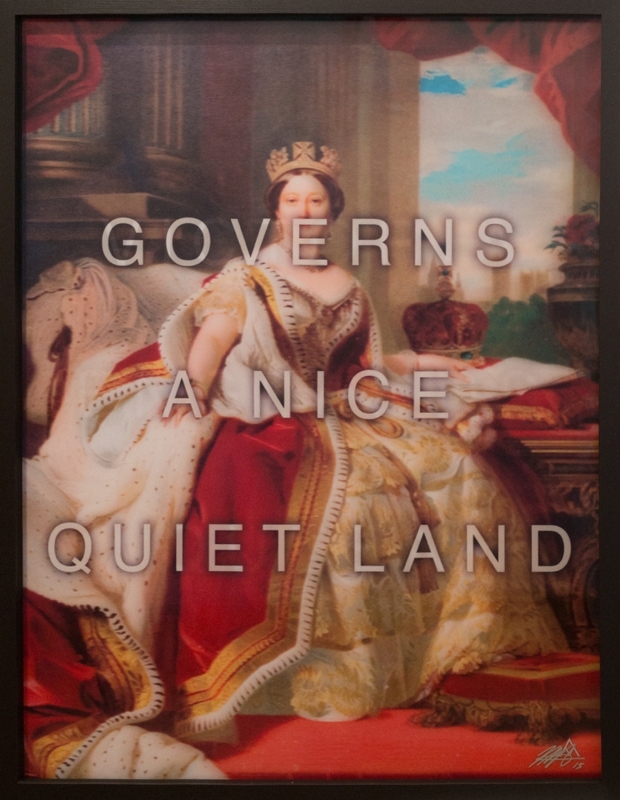 As visitors move around the gallery and observe the image from different angles, words transform from Victoria Englands Queen into an anagram, Governs A Nice Quiet Land. Every anagram is symbolic and characteristic for the person portrayed. The name of a movie icon James Dean turns into Made Jeans to emphasize the actor’s working class background, as well as his role in promoting jeans as fashionable in the famous Rebel Without a Cause film. A painting depicting the Statue of Liberty, morphs its title to Built to Stay Free, phrase that signifies the vibrant nature of those who build United States, but also refers to the institutionalized hypocrisy present in America today. Anagrams, first solo show by Massimo Agostinelli will open on Thursday, October 22nd with a special reception that will be hosted by the prominent recording artist Maxwell. In his latest artwork series Massimo Agostinelli explores various ways in which popular images and altering phrases can be interpreted in a collective mind. The exhibition will run through November 11, 2015 at Hoerle – Guggenheim Gallery in New York.